On Saturday night, on the undercard of UFC 232 at the Forum in Inglewood, California, former UFC bantamweight title challenger Cat Zingano moved up to the featherweight division for a showdown with former Invicta champion Megan Anderson. The two women collided in hopes of earning a shot at the winner of the UFC 232 main event, which pitted divisional champion Cris Cyborg against bantamweight champ Amanda Nunes. In the end, this fight ended rather strangely — and perhaps disastrously for Cat Zingano. Early in the first round, Megan Anderson uncorked a well-timed head-kick. The kick itself did not make much of an impact, but Anderson’s toe seemed to tear across Zingano’s eye. Zingano, visibly in pain, then retreated, and turned her back on Anderson against the cage. After a few followup strikes from Anderson, the referee halted the action. Once the fight-ending sequence was replayed, it became clear that Anderson’s toe indeed landed right in Zingano’s eye. In the immediate aftermath of this stoppage, Zingano appeared to be in significant pain, and unable to open her eye — possibly the signs of serious injury. While it’s unfortunate that this fight ended the way it did, the kick was absolutely legal, as veteran referee John McCarthy reminds. 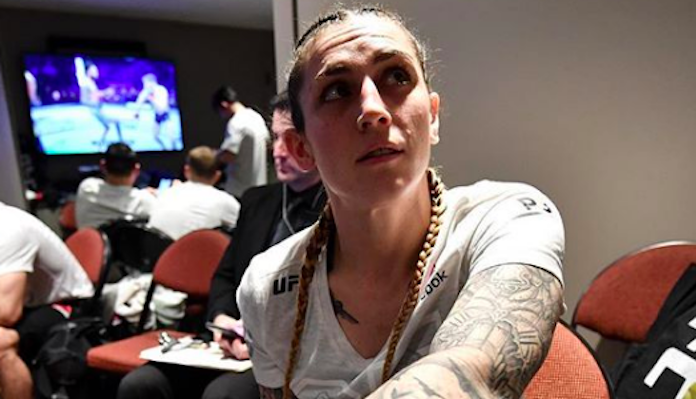 With this first-round victory, Megan Anderson has reaffirmed herself as one of the top female fighters in the world, and very possibly the next woman in line for the winner of the UFC 232 main event. That being said, she said she would give Cat Zingano a rematch if necessary. What did you think of this first-round victory from Megan Anderson?